YOUNGSTOWN, Ohio — A mild curiosity about houses in Liberty Township led resident Marcia Levy on a two-year research project. Levy, who grew up on the north side of Youngstown on Catalina Avenue, moved to Liberty in 1962 with her husband. She had always been interested in the historic houses that had been there as long as she can remember. After her husband died two years ago, she started to research the houses in the community. On Thursday, Levy presented her research during the first monthly Bites and Bits luncheon of the year at the Tyler Mahoning Valley History Center. She spent two years building her research from records on Ancestry.com, local birth and death records, a book on the bicentennial of Liberty Township, and a book by famed American industrialist and historian, Joseph Butler, who helped establish the Butler Institute of American Art, she said. “Research takes a long time, but it’s amazing how much stuff you can find on the computer and internet now,” she said. One house she researched was originally built in 1890 by John Alexander Logan Jr., an officer with the U.S. Army. In 1899, Logan was killed in action during the Philippine–American War. After a fire in the house in 1914, his wife sold the property to William Sampson, who rebuilt the house after a second fire. The former Logan property was rebuilt after two fires. After Sampson’s death in December 1929, the house was sold to the Ursuline Sisters of Youngstown, then was purchased by the Catholic Diocese of Youngstown. 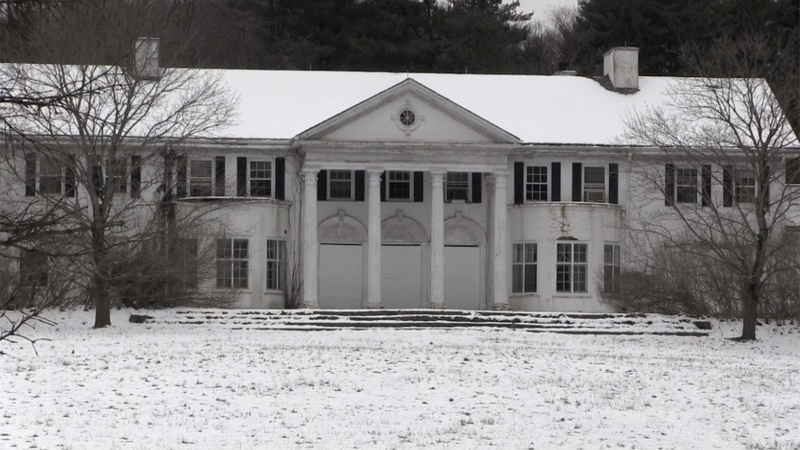 The 10,500-square-foot house sits on 27 acres of land where another mansion was also built. “And it’s a bargain at $400,000,” she said with a laugh. Levy has another project published to YouTube called “Welcome to Youngstown, Ohio.” She is working on another project on the history of houses on the north side of Youngstown on and near 5th Avenue, which she said should be done in a month. Levy emphasized of the importance of knowing the history of a community and the people who live there. “You can learn a lot from the history of where you live” she said. William Lawson, executive director of the Mahoning Valley Historical Society, complimented Levy on “a fascinating presentation” on the “full transition from the early 19th century to the mid- to late-20th century,” he said. “I think we had a large audience and they really appreciated what we did today,” he said. Bites and Bits is held monthly on the third Thursday at noon at the Tyler History Center, he said. The historical society’s mission is regionally focused on the Mahoning Valley and leverages research from other historical organizations from the townships, villages and cities in the region to put on these presentations, he said. “We are happy that we have that much breadth of research going on, and this program in part is a way for us to focus on some of the other historians in our area to bring them in to talk for an hour about the research that they have done, and to share the information with our audience,” Lawson said. The Bites and Bits History Lunch Program is sponsored and presented by the John & Loretta Hynes Foundation. The next event is scheduled for Feb. 21 and will focus on the life of President William McKinley. It will be presented by Amber Farris, director of the museum at the McKinley Memorial Library in Niles. The society’s annual Cookie Table and Cocktails fundraiser is scheduled for Feb. 23 at the Our Lady of Mt. Carmel social hall. Visit MahoningHistory.org for more information or call 330 743 2589. Pictured: Liberty resident Marcia Levy discusses her research on the historic homes of the area at the first monthly Bites and Bits luncheon of the year at the Tyler Mahoning Valley History Center.